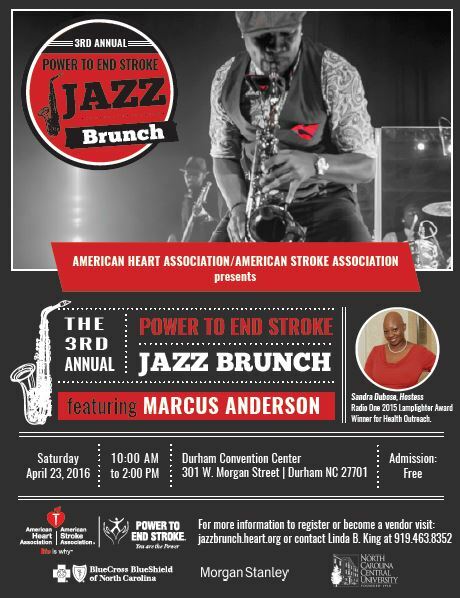 The American Heart Association/American Stroke Association presents the 3rd Annual Power To End Stroke (PTES) Jazz Brunch Saturday, April 23, 10:00 am – 2:00 pm at the Durham Convention Center, 301 W. Morgan Street, Durham, 27701. The PTES Jazz Brunch and Awareness Fair is an education and awareness campaign that embraces and celebrates the culture, energy, creativity and lifestyles of Americans. It unites people to help make an impact on the high incidence of stroke within the community. Featuring national recording artist Marcus Anderson, hostess Sandra Dubose, and Donald "DJ Smooth" Brumfield. This event will kick-off our stroke month activities. May is Stroke Month! Join us for free health screenings, fitness activities, cooking demonstrations, workshops, and more! The event is free, but each person must register to attend. For more information, to register offline, or if you have questions, please contact Linda B. King at 919.463.8352 or email linda.king@heart.org. Vendors must register by emailing linda.king@heart.org insert Jazz Brunch Vendor Registration in the subject line and your contact information in the body of the email. You will be contacted to complete your registration. For registration by phone contact Linda B. King at 919.463.8352. This event would not be possible without the support of our generous sponsors. If your company or organization is interested in supporting the Power To End Stroke Jazz Brunch, please contact Linda B. King at linda.king@heart.org or 919.463.8352. Sponsorships begin at $1,200 and we will be happy to tailor a package to meet your needs.